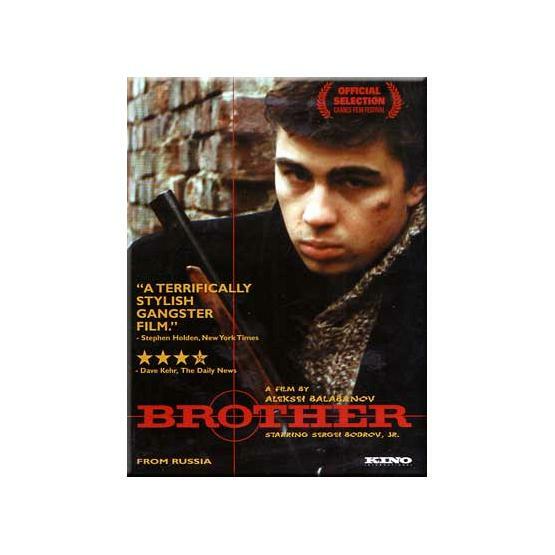 "Brother" (1997) is a story about a patriotic young man who comes back from the army only to be dragged into the killing business by his own brother. Directed by Aleksey Balabanov. Starring Sergey Bodrov Jr., Viktor Sukhorukov and Svetlana Pismichenko. Awards: Brothers Manaki International Film Festival (Golden Camera 300), Chicago International Film Festival (Silver Hugo for Best Actor), Cottbus Film Festival of Young East European Cinema (FIPRESCI Prize), Sochi Open Russian Film Festival (Grand Prize of the Festival), Torino International Festival of Young Cinema (FIPRESCI Prize, Jury Special Prize). TV system: NTSC. Aspect ratio: 4:3. Sound format: Dolby Digital 5.1. Language: Russian. Subtitles: English.